It was my parents’ first visit to China, and after a few days running around the busy streets of Nanjing, I thought a day-trip to Yangzhou would make them happy. They were enjoying themselves, at least reasonably, but I was exhausted. They didn’t speak a word of Mandarin, and I had to organize everything. The culmination of their journey was coming soon: a big introduction dinner to my future in-laws. Below the gleeful surface, that’s all we were thinking about. “Should we go?” I suggested, biting into the last gingko-nut cake. 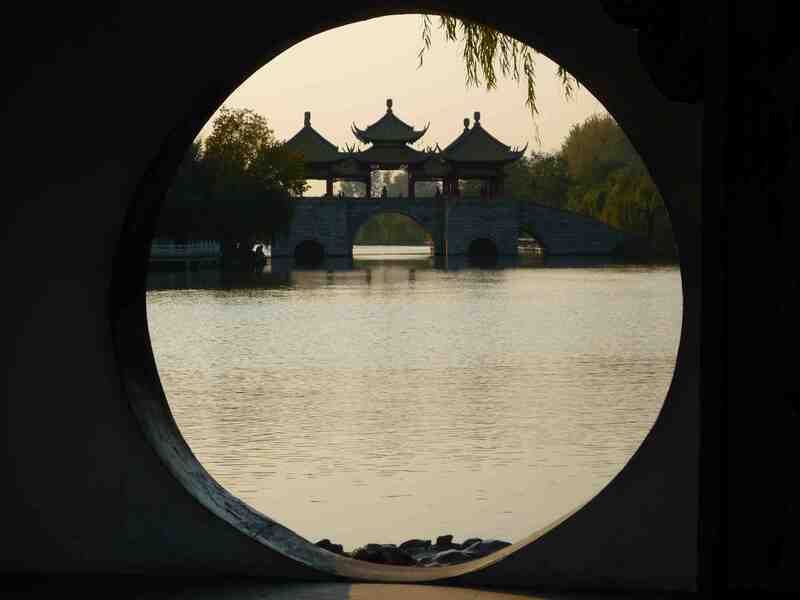 We stood up from the wooden table, and resumed our stroll across the canals of the Slender West Lake area, crossing over arched bridges, wandering through bamboo groves, or gazing through circular moon-gates at the distant pavilions. Then, exhausted from so much beauty, we got a cab to the station, and arrived just on time for the 5h05 train back to Nanjing. We sat opposite a loud group of country people who kept staring at us for most of the trip, repeating the word ‘laowai, laowai’, and laughing. They reeked of cold tobacco, and spat sunflower shells all over the floor. My mother did a regal job of ignoring them, but I could see my father passive aggressively looking out the window. His goal was probably to shame them into silence, but his behaviour had absolutely no success. Chen Jie came to pick us up at the station, and escorted us back to Gulou. My parents had 15 minutes to refresh. ‘That should be enough’, said my mother, ‘I’ve already chosen my dress and shoes for tonight’, but I could see that my father was annoyed at having to rush. ‘We’ll be waiting in the lobby’, I said, hoping that would encouarge them to do their business quickly. I laughed, and held her in my arms, while she mock-pouted – meanwhile pressing her body close to me mine. ‘Do you think your parents will arrive early?’ I asked. ‘That’s OK, you don’t need to worry.’ She replied. But I knew she didn’t mean it: 7h30 was late for a Chinese dinner, and I didn’t want my family to seem impolite. The trip to Yangzhou would play in our favour though. Chen Jie’s father was working for the local government there through the nineties, before he got transferred to the regional capital. According to the family mythology, he played a crucial role in protecting historical parts of the city from destruction – which made him a retrospective hero when authentic Ming dynasty temples started to push up the price of nearby commercial real estate. By 7h10, my parents still hadn’t made their way back to the lobby, and I started feeling murderous instincts. I could picture the Chens alone at a large table, and their impassive smile. ‘Maybe your parents are tired, and they needed some rest’ said Chen Jie. ‘They’re fine,’ I replied, ‘they just don’t have a very good sense of time’. I started dreading the coming dinner. Would my father sit brooding all night, or make obnoxious remarks about China? How should I react if he did? Play filial son, and shut up, or politely contradict him, at the risk of us all losing face? Chen Jie was generally my guide through these arcanes of cross-cultural politeness codes, but when it came to my family, I couldn’t dream of asking her directly. They finally came down at 7h15. ‘It’s my fault’, said my mother, ‘sorry: I had my dress on, and then I made a big stain with my lipstick.’ Chen Jie smiled ‘It’s OK, you can be late in China.’ My father though it was the perfect moment to press his point: ‘See – you’ve been rushing us for nothing.’ I cringed. We finally made it only ten minutes late. The Chens had insisted on taking my parents to ‘Grandma Xiang’, a new traditional Jiangsu restaurant on the top floor of the Golden Eagle shopping mall. ‘Are we going to some sort of food court then?’ asked my mother, slightly perplexed, when we stepped onto the escalator past a Starbucks, and emerged into aisles of menswear. I explained, again, that the best places in China were often located inside shopping malls: ‘I guess it’s just the way they do it then,’ she said, and on we went along stalls of jade jewellery. For better or worse, the place was remarkably noisy – hot and loud, as the Chinese say. The waiter escorted us to a window table where the Chens were waiting for us. There were two small cups of green tea on the table, and a small plate of sunflower seeds, untouched. Everyone shook hands, unsure how much physical contact was appropriate on a first meeting. Then we all sat down, foreign parents facing Chinese parents, while Chen Jie and I took both ends of the table, so that we could informally translate through the dinner. The dinner was painful, but catastrophe was avoided. Conversation rolled over first impressions of China to the canals of Yangzhou, then to modest insights into the Chen family mythology. High-speed and low-speed trains featured – the pace of urbanisation – and heritage conservation. Then the food arrived: salted duck in thin slices, sweet lotus root, stinky tofu. Mrs Chen remarked, impressed, how agile my mother was with her chopsticks, and Mr Chen, cheerful, called for a bottle of Baijiu. My father fought over the bill, as I instructed him to, but the Chens had already made a deal with the restaurant. We duly thanked them, promised a similar feast when they came visit, and shook hands – this time with slightly less embarrassment – outside the doors of the Golden Eagle shopping mall. Chen Jie walked her parents back home, while I escorted mine in a taxi. ‘I can’t believe you’ve been gone for so long’, she commented. My father walked up to the window, and looked outside. My mother was looking at me, smiling. ‘You did a good job, dad,’ I replied, and he went over to sit in an armchair opposite me. ‘So, do you have a date for the wedding?’ she asked? I wasn’t an early sinophile: I studied French in high school, and had no particular interest in Asia beside kung-fu movies and pork dumplings. Then I got this scholarship to spend a year in Taiwan, and that’s when it really started. My mother made a little loving noise, and I smiled back at him. We gave each other a warm smile of affection, then started exchanging memories of past holidays together. NOTE: This story is the fifth in a planned series of #52, recomposing my memories of a term in China through fiction. All characters appearing in this work are fictitious. Any resemblance to real persons, living or dead, is purely coincidental. This story was written with the help of DraftQuest. Image and story are copyright @julienleyre.